Enjoy the warmer weather in a beautiful garden oasis in your new home. 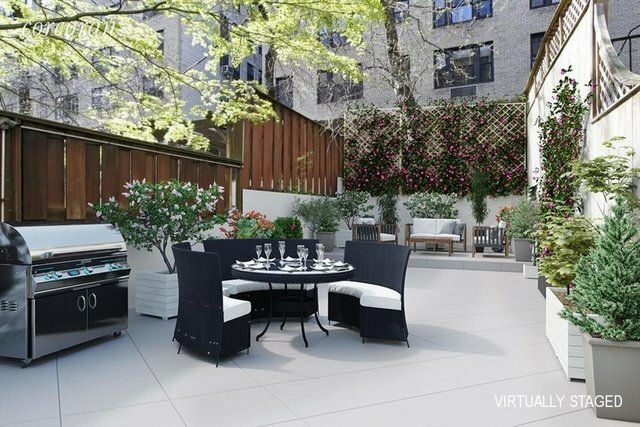 Live in elegance and charm in this 4-bedroom, 3.5 bath triplex with private garden on the Upper East Side! Warm and inviting, 234 E 74th #1 features soaring beamed ceilings in the garden level living area with built in Bose sound system, an open concept kitchen with brand new countertops and backsplash, 2 working + 2 decorative wood burning fireplaces, full laundry room with washer/dryer and separate utility room, and ample storage. Each bedroom features a large walk-in closet plus addition closet and storage space.The master bedroom en suite features a full sized Jacuzzi tub/shower, while the top level features a beautiful oversized tiled shower with dual shower heads. This is simply a must see! Located in the heart of the Upper East Side on a quiet, tree lined block in a well-maintained boutique 3-unit brownstone, close to Equinox, Citarella, Maison Kayser, JG Melon's and Scoop. Three blocks to the 6 train. Schedule a viewing today!